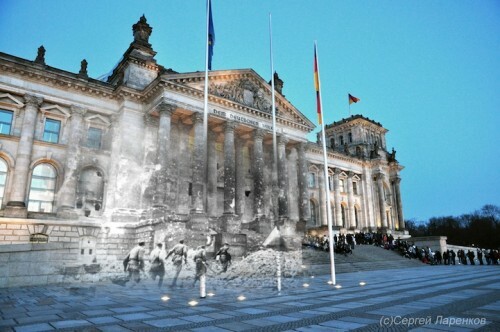 A week or two ago, Jo Hedwig Teeuwisse’s ‘Ghosts of History’ project made the rounds online. 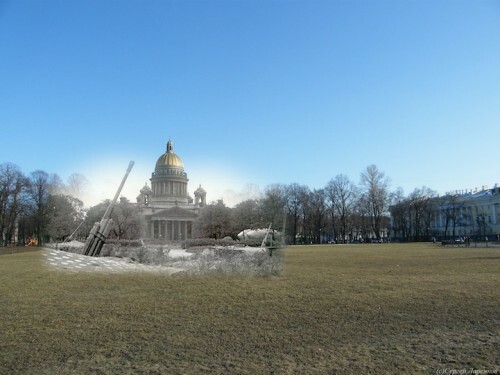 Using Photoshop, Teeuwisse has blended photographs from World War II with modern day photographs taken of the same location. The images have been reproduced at the Atlantic, the Huffington Post, The Daily Mail, and The Sun, to name a few, and similar projects have been popping at regular intervals for awhile now – here are some different examples – so there’s evidently something compelling about this kind of series. The reason these kinds of images are compelling is because they present us with an opportunity to see what’s always there but has been made – by time, by forgetfulness – invisible. 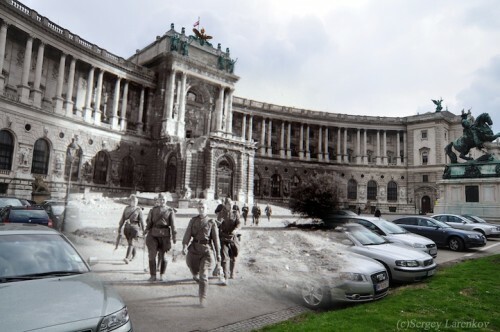 Here are (some of) the layers of history made visible again; here’s a kind of manifestation of place-memory; a new way of bridging whatever gap exists between then and now. A complete such representation, however – a sort of visual deep map, contained in a single photograph – would be mushy, grey, like what happened when someone put a photograph through every single Instagram filter, turning a tree-lined lane into a big white splotch. If you took a photograph of the same street from every day since photographs of that street exist, say, and laid them one on top of the other, the resulting image would be virtually meaningless; instead of revealing story, the layers of memory and history and change would obfuscate each other; the swarm of ghosts would be so thick that you wouldn’t be able to discern anything. So you become the monument-maker, with your photographs or your words. You say, the thing about this particular crosswalk that I want you to notice is that here is where four soldiers stood seventy years ago; or, the thing about this particular park that is important to note is that here is where I had my first kiss. Initially the thing I was going to say about all this was something like: Isn’t it cool? 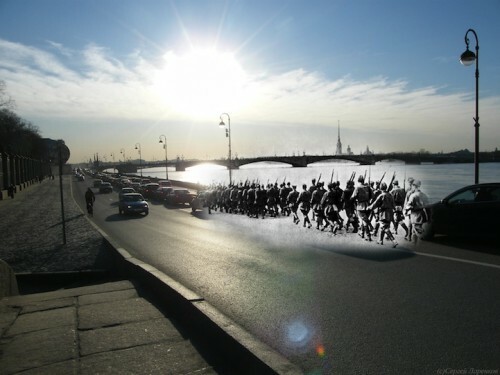 Technology allows us to visualize history! Now we can create a different kind of cross-section of a place! The possibilities are endless! I guess what I’m surprised by is not that projects like Teeuwisse’s get so much attention – it’s that there haven’t been more of them! And yes, it is cool. But then I thought more about it. I thought about how, when I walk back from the supermarket through my little suburban neighborhood, laden with groceries, history – even my own – is largely invisible. Here’s the house where a friend once lived, or maybe still does live, but we’ve fallen out so I’ve no idea. There’s the house that one night burst seemingly spontaneously into flames; we sat up in bed with our noses pressed against our window, watching the firemen arrive. There’s where a man in a bright red convertible once honked at me because I was cycling too slowly or because my skirt was too short, setting back my progress towards confident city cyclist by at least a day. Even if I acknowledge these things – which I rarely do, too aware of the weight of the bags pulling on my arms, too absorbed by this or that, thinking about a problem I need to solve or making up a story in my head which has nothing at all to do with my surroundings – they seem not to change the way I’m moving or the reason I’m moving or, for that matter, the space I’m moving through. There’s an element of so what? So what if on this corner, someone was once stabbed; the blood has been washed away by rain and years (and, presumably, street cleaners). Even historical facts don’t really matter: so what if William Morris lived here? So what if Roger Bannister ran the first recorded sub-4 minute mile here? So this: places are crowded, even at dawn when there’s no one around but the weary commuter on his folding bike. As Hardy writes: “There were poets abroad, of early date and of late, from the friend and eulogist of Shakespeare down to him who has recently passed into silence, and that musical one of the tribe who is still among us…” And there’s Edward Thomas, writing about Oxford in 1903: “The past and the dead have here, as it were, a corporate life. They are an influence, an authority; they create and legislate to-day…as I walk, I seem to be in the living past.” Places are haunted, as they are also haunts; “A haunted place has become stuck in time, or time has been scored into it,” writes Steven Connor. 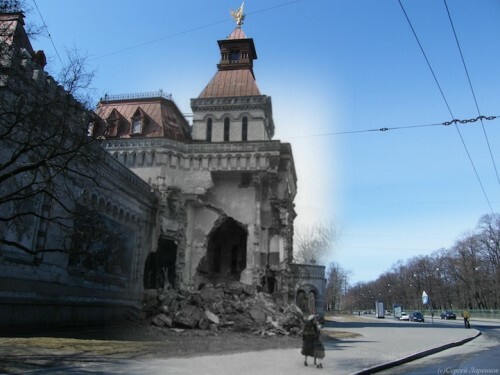 And yes, on one level this kind of intimate spatial history is largely irrelevant. I mean to say, as I’ve said already: I don’t walk down the street bearing in mind all of the things I know (and don’t know, but intuit, or imagine, or misunderstand) about that street at once. I couldn’t even if I wanted to: I couldn’t hold them all in my head. Like the imagined photograph turned grey by too many layers of history (or too many Instagram filters), the mind starts to cloud if it’s asked to be the bearer of all of a place’s weight for too long. People write books about the idea of place, what it means; you could spend a lifetime reading and speculating just on that. But also, a place is just a place: I mean, the street corner is just a street corner. It both contains and does not contain its own history; it creates it, hides it, displays it, rejects it, rewrites it, memorializes it. And I’m just trying to get my groceries home before the bag breaks. But on another level, it’s not at all irrelevant, especially not now. Because the question that’s being asked is not about the value of making hidden or forgotten histories apparent; it’s about the technology(ies) that allow us to do so in the first place. The jumping off point for this essay was a series of photographs, but what I’m interested in is not really those photographs – after all, we’ve long been able to manipulate photographs; and photographs are themselves often both manipulators and manipulations of their subjects. What I’m interested in is the manipulation – or, rather, the potential for manipulation – of our sense of place, via technology. Technology changes our remembrance of the past, our experience of the present, and our imagination of the future by blurring the lines between the three categories, and introducing different forms of understanding and meaning-making to all three – We remember the future, imagine the present, and experience the past. So my question is: what does it mean that technology gives us the opportunity to give ghosts material form, to show the haunted place as haunted? And the answer to this question is, I suspect, something we’ll be dealing with and writing about for years to come. The photographs are just a metaphor: they represent a new way of being in place, an augmented reality. Which question is, I think, the crux of what’s interesting here. We know that history is hanging around and staying, that places are fraught with memory, and that technology both adds to the layers of representation and experience embedded in a place whilst also providing a new way of thinking about that place. And we’ve arrived at the period in history when localized information, in multimedia form, can be (and is) regularly delivered to individual users. So where do we go from here? What place-based information do we choose to broadcast and to receive? What does that do to the places themselves – which are already dynamic, already processes as well as points on a map? And what does it mean that a place can potentially begin to intrude on me, and not just the other way round? Say I’m walking home from the grocery store. Say a notification pops up on my phone: what if it changes my relationship with the street I’m on? What if it’s just more noise? Perhaps an interesting counterpoint to Teeuwisse and co’s layered photographs are manipulated images that depict normally crowded places as empty – Matt Logue’s “Empty LA” project, for instance (and the “Empty America” series it inspired), or Lucie and Simon’s “Silent World” project. In the worlds illustrated by these artists, LA freeways are devoid of traffic; there’s just one lone figure in a desolate Times Square. On the one hand, you can say the city is never empty, even when it appears empty (all those ghosts, remember – Hardy’s “poets abroad”). On the other hand what these images suggest to me is a desire to show the place as a stage; to show it as a setting, as a backdrop – or, alternatively, as a player in its own show: complete without the noise of individual human lives, both a product of those lives and something quite independent from them. To me there’s something about the (apparently) empty city that invites a much more personal interpretation: when the ghosts are unseen, when even the living are hidden, the cityscape perhaps becomes more like a mirror than a window. So technology can do much to harness the power of place – to make memory increasingly social, to represent “the shared experience of bodies co-located in space” – and I think it should: I think this is part of the joy of it. But perhaps we also need to think about preserving the utterly private relationship with place – and what this preservation will look like in a “geo-optimized” world. Miranda Ward (@aliteralgirl) is a writer and a PhD student at Royal Holloway, University of London. She is interested in the intersection of geography, literature, and technology and blogs at www.aliteralgirl.com. The rapid spread of electronic communication technologies in the 1960s altered our perceptions of time. This led to my creation of the Generative Systems program at the School of the Art Institute of Chicago from 1970-1980. A final course in that program was called Homography or the visualzation of time. Layering was suggested as one of nine possible ways for visualizing time. Of course nine was just a number to which many more ways could be added. 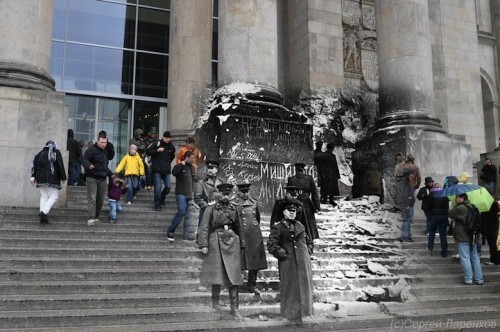 Layering of historical images is one response I thoroughly enjoy.